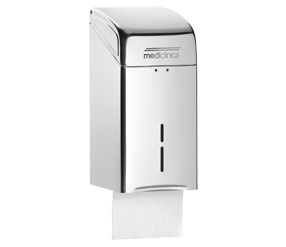 Mediclinics toilet paper dispensers provide a solution for heavy duty paper rolls as well as for standard rolls. The product line is designed to equip any public washroom, offering different products that adapt to the different needs of the washroom that is to be equipped. These models are designed for high traffic washrooms that experience a large influx of people. The solutions provided by this category are available in three different finishes: White epoxy steel, bright AISI 304 stainless steel and satin AISI 304 stainless steel. Highly resistant solutions for high traffic, with anti-vandalism features; the body is made of a solid piece and they have a Mediclinics standard safety lock with a key, which is provided with the product. Also, all of them incorporate a slot on the front of the model to allow viewing the amount of paper remaining and they have an AISI 304 stainless steel axis with inertia brake to optimize the dispensing of the paper. These models are designed to be used in restaurants, offices, hospitals, etc. and provide value added to the design. All of these are capable of holding between 2 and 3 toilet paper rolls and, depending on the model, they include an automatic mechanism, which causes the next roll to drop once the bottom roll has been used. With anti-vandalism features, all of these include a special key for opening the casing as well as an axis with anti-spin brake by inertia, to ensure a more rational use of the paper. Manufactured in steel or AISI 304 stainless steel and available in three types of finishes: Epoxy white, bright stainless steel and satin stainless steel.